All jokes aside, the quality of catering services greatly influences your attendees’ overall experience. As professor at Queen Margaret University in Edinburgh Joe Goldblatt notes, "Historically, events have been associated with food and beverage." And what else can prove that theory correctly than the large variety of catering service styles an event manager can choose for his or her event? From standing buffets to brief cocktail receptions, there's an entire range of options to satisfy your needs and goals. Not to mention the multitude of menus, trends, and food presentations. So as you can understand, you have to be 100% aware of your choices, when it comes to decide what and how your guests will eat during the event. However, managing catering-related logistics can be a difficult task to accomplish, especially if you have little experience. And the problem is not about which catering service style to choose or which menu the attendees will enjoy more - the challenges appear when you have to set up the catering area. You see, the positive experience of your attendees depends not only on the quality of the food, but also the way it is presented and delivered. In other words, if you don’t know how to set up a friendly catering area, your lunch break or cocktail will fail. And it doesn’t matter if you hired the best chefs in the city—your attendees’ experience will depend on how well you organized the dining area. And although catering suppliers will assist you, as Joe Goldblatt highlights, "The event caterer may have substantial experience working in a permanent venue, but when asked to provide services off-premises he or she may not be aware of the additional rigor required to survive in the jungle." That's why we came up with a few quick tips to help you understand which aspects you should focus on when setting up affable catering environments. So use the following ideas, especially when you want to plan a standing buffet. Instead of placing all the beverages on one big table, ask your catering provider to set up smaller tables in different corners of the room. This way, you’ll avoid the crowd formation and the attendees will have more space to mingle and enjoy their drinks. As you already know, the location and number of attendees dictate the way you’ll place the food tables. Yet, to optimize the flow of your guests, you'll have to manifest a smart approach. Depending on the configuration of the catering space, decide where to set up the food tables so that people can move freely and not feel confined. Also, as Joe Goldblatt recommends, "Do not place food stations in areas that are difficult to replenish. Large crowds of guests may prevent service personnel from replenishing food stations efficiently." This decision is a tricky one. If you choose the self-service option for the drinks, for example, you'll be able to cut some expenses. No personnel needed, meaning more savings. "And how about the cost of the drinks? What if instead of two glasses of wine, the attendees will have nine?" you may be thinking. No worries about that. You may encounter two or three 'thirsty' attendees, yet people usually drink moderately in such occasions. However, depending on your goals, you may want to go with the second option. So if there's limited time or if the attendee headcount increases the location’s capacity, the best option is to ask for the catering personnel’s assistance. Let’s say instead of a buffet, you decide to choose to serve only appetizers or hors d’oeuvres. In choosing this option, the catering personnel will mingle with the attendees, offering different canapés or one-bite appetizers. This action will repeat a few times, depending on the number of canapes you agreed to serve. Taking these parameters into account, it's important to establish the speed of each passed item. If you are pressured by time, you can ask the catering personnel to serve each item quickly, or only once. On the other hand, if your goal is to create a relaxed networking environment, you'll want to slow down. Apart from deciding how quick the catering personnel will serve the attendees, you’ll also have to create their itinerary. There’s nothing more annoying for guests than to see the catering personnel just three meters away, yet no one approaches them and offers them canapés. Don’t make your guests run after the food. Be sure that the catering personnel covers all the areas and offers food to each guest. 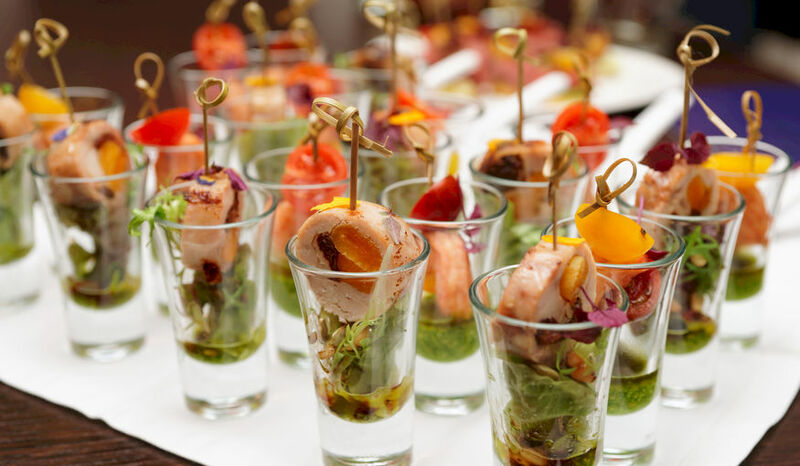 When it comes to event catering settings, it's easy to get overwhelmed by the multitude of options. However, putting aside the complexity of this topic, your main goal is to focus on your attendees' experience. To set up a friendly catering environment, always think from your guests’ perspective. Will they be comfortable? Are they enjoying themselves? Does something seem to be bothering them? Also, take into account the goals you are pursuing by running the event. Do you want your attendees to have an enjoyable networking space? Is your intention to enhance the engagement of your guests? Or do you just want to keep them alert? The answer to these questions will help you set up efficiently a friendly catering environment. One of the best lessons we've learned in catering business is to always touchbase with clients a day before the event to wrap things/plans.